The Healthy Shopper is in it’s sixth season now! I’ve been covering their picks for the past few years and have found a number of fantastic products because of their recommendations. The Healthy Shopper was founded by Andrea Donsky and Randy Boyer who wanted to help Canadians eat more natural and organic foods without breaking the bank. They realized that it costs a little more to buy these types of products and have compiled The Healthy Shopper coupon book to save consumer money and hopefully entice them to try new products. So what’s included for Fall 2014? Let’s get started. 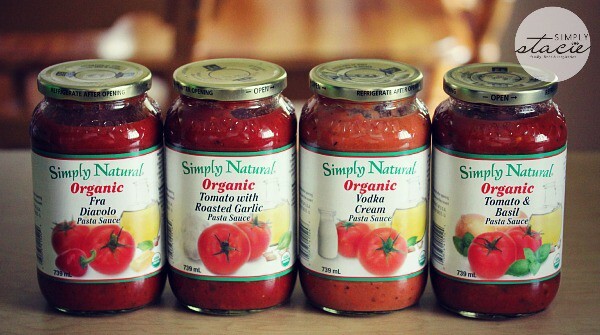 Simply Natural Pasta Sauces are certified organic, fat-free with zero trans fats and no high fructose corn syrup. You can find them at most major retailers like Loblaw, Sobeys, Whole Foods, Save on Foods, Metro and more for an SRP of $4.99. I received four flavours: Fra Diavolo (spicy!!!! ), Tomato with Roasted Garlic, Vodka Cream and Tomato & Basil. 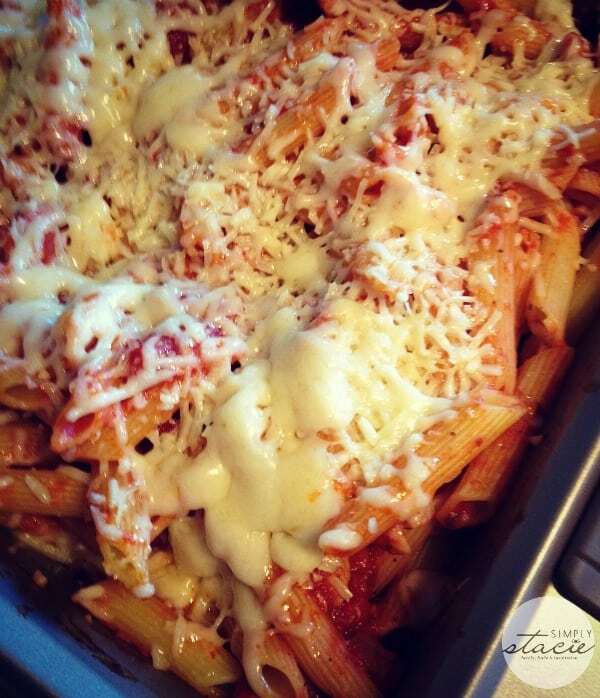 My kids love pasta bakes which is basically just cooked pasta, sauce and topped with shredded cheese and baked for about 10 minutes. The first one we tried was Fra Diavolo and my taste buds lit up with the first bite. It is hot! A good kind of hot though. I had never heard of Made Good until The Healthy Shopper. I’m so glad they introduced me to this family business. 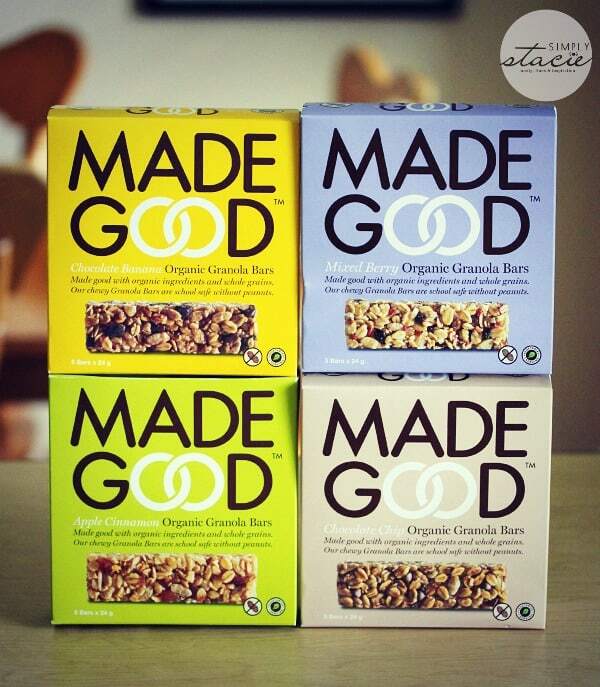 Made Good is passionate about providing healthy snacks rich in nutrients and minimally processed. Their products contain only wholesome, ethically sourced organic ingredients and whole grains. The Made Good Organic Granola Bars and Minis contain one serving of vegetables and are made without peanuts. The granola bars are a little smaller than the ones we normally buy, but seem denser and more filling. I’m a huge fan of the Apple Cinnamon flavour! My youngest likes to bring the Chocolate Banana in her lunch to school. The Minis are bite sized snacks you can grab a handful of on the run or add them to some yogurt for a breakfast. I think these are my favourite product from the Fall picks. I need to buy more because they were the first product to disappear! I love adding mine to some yogurt for breakfast. Pick some up at Whole Foods, Sobeys, Metro, Loblaw and more for an SRP of $4.99. Olympic CHIA Balkan style yogurt is Olympic Dairy’s new chia yogurt and is also the first yogurt on the market with chia seeds. I wasn’t able to find any near me, but on my next trip to Ottawa I will hit up some stores to buy some to try. Chia is a super food and is a source of protein and fiber. It’s also the richest plant-source of Omega 3 oil and the yogurt contains both pre and probiotic. It’s available in strawberry, vanilla, plain and pandan. Find it at Loblaw, Sobeys, Metro, Save on Foods and more for an SRP of $4.29 to $4.49. Pamela’s Products is known for its quality gluten free baking mixes, cookies, snacks and more. Featured in this year’s Fall picks are Pamela’s Artisan Flour Blend and Roll and Cut Sugar Cookie Mix. I used to follow a gluten free diet and have tried many of Pamela’s Products in the past. You can find them at Whole Foods Market, IGA, Sobeys, Nutters and Overwaitea. Two non-food products featured are Allimax and Hyland’s. Allimax is known as nature’s antibiotic and is features allicin, an active component of garlic, that has many health benefits like boosting immunity. Very handy with flu and cold season now upon us! It’s sold at health food stores, natural retailers and Loblaw. Hyland’s makes homeopathic medicines and this year’s picks showcase Hyland’s Baby Tiny Cold Tablets and Hyland’sBaby Cough Syrup. The Baby Tiny Cold Tablets instantly dissolve in your babys mouth and is used to treat colds, runny noses and congestion naturally. Want to try The Healthy Shopper Picks? Pick up a coupon book at a retailer near you. Check out a sneak peek of what’s inside. Connect with The Healthy Shopper on Facebook. I Would like to try the Simply Natural Pasta Sauces. I would like to try the organic granola bars. Being a student i am always on the go and nutritional food that is quick and easy is an asset. I want to try the Organic Granola Bars. The Balkan Style Yogurt looks delicious! I think the Made Good Granola Bars and Minis look so yummy! I would be most excited to try those. I must try the Vodka Cream Pasta Sauce. The name itself is too intriguing to pass up – and we do eat a lot of pasta. The minis would be my first choice , but the sauce close second . Thanks for chance. The granola bars look good,there’s a lot of good appealing healthy stuff to choose from! I’m looking forward to trying the granola minis, they look tasty! The Made Good products look perfect for our family! 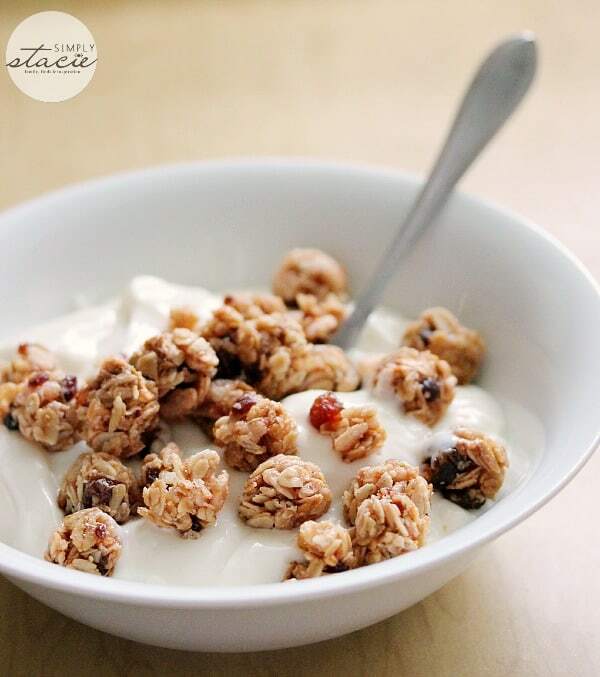 Definitely the Made Good granola! I look forward to trying the granola bars! the pasta sauce looks divine!